His twin sister Sammie likes being a twin too. She knows that she's perfect best friend material for somebody - the girls in her class just haven't realised yet. And she knows that she's the best Sam - Sam A. 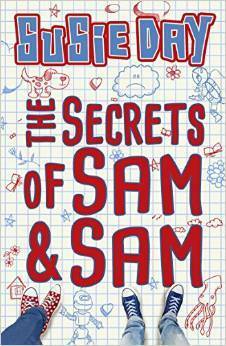 Both Sam and Sammie - and everybody in their lives seems to be keeping secrets - which ones will come out? Another fabulous read from Susie Day with lots of heart and thoughfulness challenging stereotypes and labeling. Really lovely. I love the contrast between the twins and how their personalities break stereotypes with each twin actively encouraged to be the person they want to be without worrying about the different expectations society can put on them. Parents of young children should all be forced to read this. I also liked the outlook this book had on family. The twins are raised by a Lesbian couple and think nothing of it. It was interesting to see the reactions of people who were not familiar to the family. I loved how the story showed that what is important is the people who are there in your life as opposed to the ones who aren't no matter whether they are blood related or not. A fantastic and thoughtful read. Very much recommended.